Just hours after the UN General Assembly delivered a second diplomatic slap to President Donald Trump in a week, voting to reject the US decision to unilaterally recognise Jerusalem as Israel's capital, France's President Macron has welcomed the Palestinian President Mahmoud Abbas to the Elysee palace in Paris. 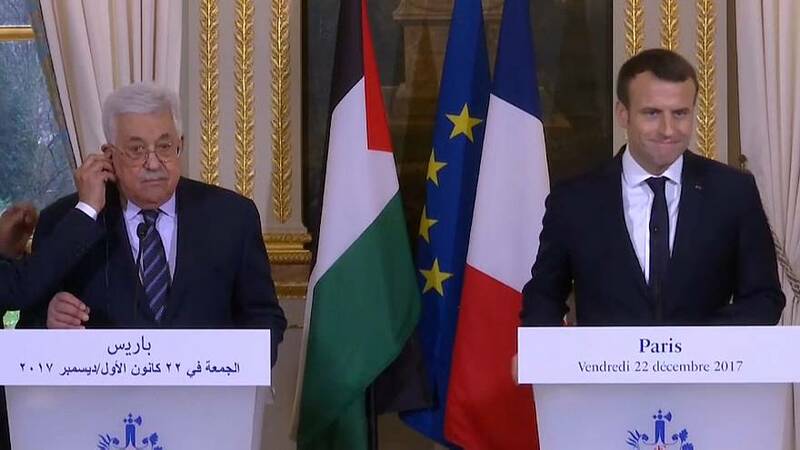 Speaking one after another to the press and without taking questions, Macron re-interated France's adherence to a process validated by the international community and years of diplomacy; dialogue and negotiations leading to peace, involving a two-state solution with Jerusalem as the Palestinians' capital, which the Palestinian state would share with Israel. France was one of 22 EU countries, and 128 in all at the UN, to vote the US down. "There is no alternative to the Two-State solution, and no solution to the two states' problems without agreement on Jerusalem," said Macron. Trump's decision to recognise Jerusalem as Israel's capital and move the US embassy there killed off the US as a mediator said Abbas. "Whoever offers such a project, making Jerusalem Israel's undivided capital and transferring their embassy there, contrary to all the international laws is not, I believe, able to offer a fair and just solution to the Middle East peace process," he said. Both men said living side by side as peaceful neighbours was made more difficult by Israel's settlements policy, but Abbas went further, saying the settlements were a threat to Palestinian sovereignity. He also condemned the Israeli security forces' reaction to the current wave of what he insisted were peaceful demonstrations across the West Bank. He paid particular attention to the much-reported case of a man in a wheelchair who Abbas says was acting in a pacific manner at demonstration before he was killed. "What kind of humanity allows this?" he asked. Abbas also insisted he would be striving for reconciliation between Fatah and its political rival in Gaza, Hamas. He said the current division within the Palestinian Authority would be resolved and it would once again run Gaza, and that the Palestinan people needed unity, because only by being united would they succeed.